I am getting this one out a little later than planned… Sorry about that. 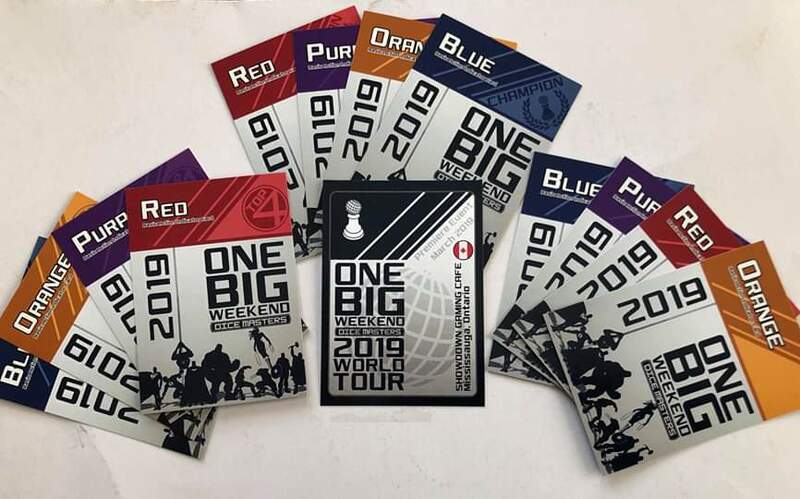 Reg (from Dice Masters in the Great White North graciously shared his report on what was the first ever One Big Weekend Event held in Mississauga, Ontario, Canada. I will be handing the reigns of the article over to him for the remainder. Take it away Reg! We held Our One Big Weekend Event at De Code Adventures in Mississauga, Ontario Canada, on the afternoon of Saturday, March 2. Due to a snow storm earlier in the morning, three potential new players that were planning on attending were unable to make it out. We had a total attendance of five players. In the last few months, we have lost a couple of our regulars to work (Dave) and travel (Marcus), but we are hoping they will come back one day soon to our weekly events. 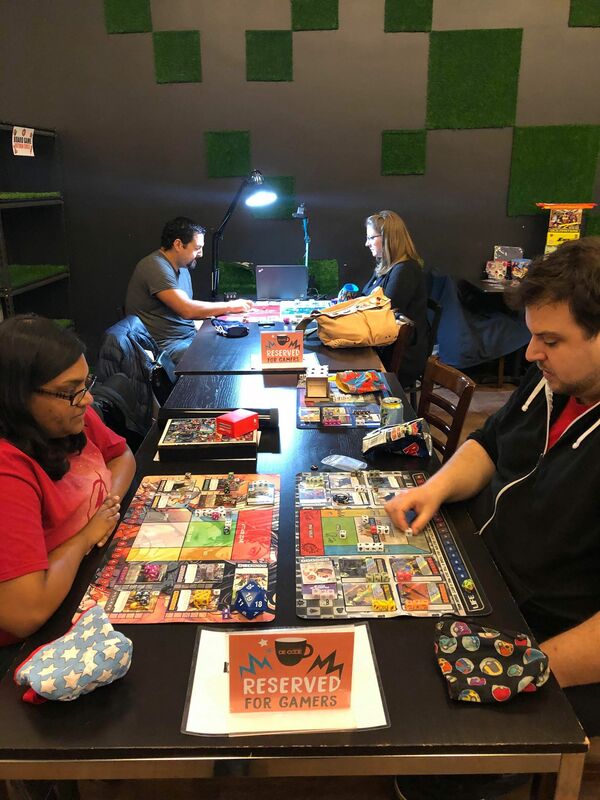 While we are only 5 in our local group we would like to point out that we placed 3 (of the 3 that attended) in the top 8 at Canadian Nationals last year, and we are all hoping to join the event this year. The first thing we noticed when we arrived at our local LGCS was the prize table. 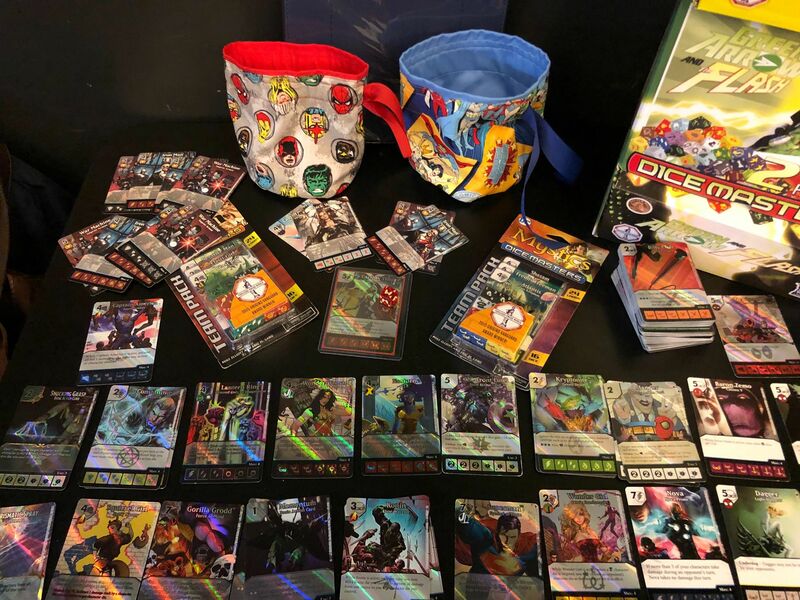 It had Booster Packs, Team Packs, Promo Cards, Dice Bags oh my… There were other events going on at the location, but our prize table caught the attention of others board game players that day. 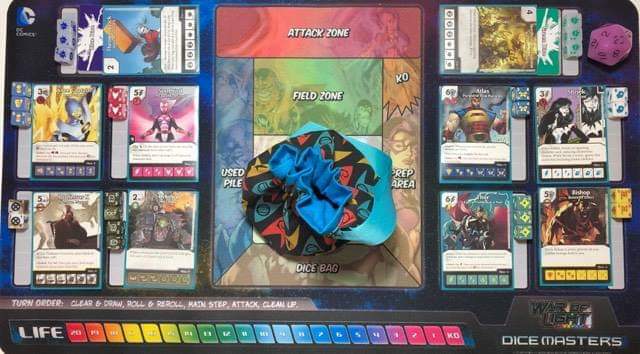 The other thing we noticed was the camera stand setup, we were going to stream the event, however as we played game 1 we noticed the proximity of the headset to the playmats. We couldn’t really commentate while they were making their decisions. In a future event, we are thinking of taking the streams offline, and will replay them as a group with the walkthroughs. In the end we did basic descriptions of the players actions but didn’t going into any details of what we thought we would do during the matches. We were going to run two events during OBW. The first was a Modern bring your best team for a Round Robin tournament. We banned Rare Cosmic Cube, Rare Gold Dragon, Super Rare Yuan-ti and Super Rare Ring of Winter. Everything else was allowed that was Modern legal. We also had a side-event doing a rainbow draft each receiving 12 packs from Green Arrow and the Flash. Our side event we asked players to bring all their dice they previously had in their GATF collection and would be allowed to be added to their Rainbow draft pulls, but you could only use the cards you drafted. For my team in this event, I brought my favorite team currently in the Meta Dreadnaught Surtur. I really enjoy playing this team as every game is different when you play as you have options. Do you go for Surtur Early, or try to use Dreadnaught to ping off the opponent with Range? 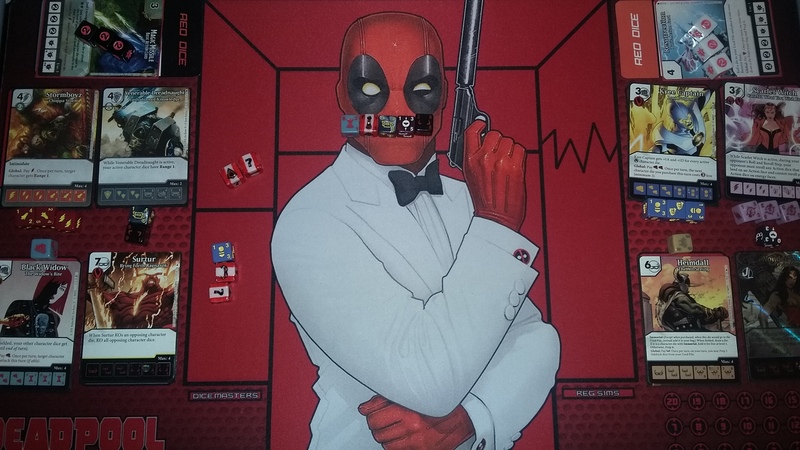 This build was previously used by Zack Pope, and I have been playing with adding different cards to the build to tweak it to my liking and still a work in progress. Here is the report of my matches and what I was up against each game. Rob was running a control team with Blob, Dreadnaught, and Hulk. Win Con for Rob is to get Hulk out on Level 3 and start pinging. I was able to get out an early Dreadnaught and Black widow and started hitting for 9 damage. It was a gamble, as it was hard to build up my field again. Eventually I bought Surtur just in time, when Rob was ready to swing for lethal. I ranged out one of his characters and cleared his board leaving me an open field to deal the final damage. Jocelyn was bringing a variant of a build she did a few weeks prior from our Legacy league. The Win con was Seething corruption and required Ork Nobs to be in the field when Songbird to be fielded that would Basically breath weapon 2 to clear a lot of my characters. I saw this coming and just kept attacking in smaller numbers leaving none of my smaller characters on the field. 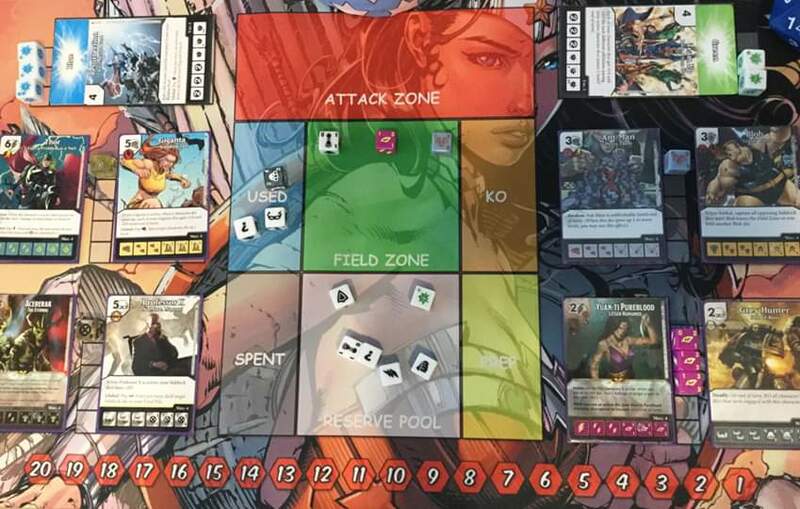 Wonder Woman, Dreadnaught were my two main purchases this game, and after getting them out, it was time to have Black widow to pump, and I was able to push for Lethal before the Songbird combo could do nasty damage. Very interesting Build Jocelyn had, and inspired another build I have built around Seething Corruption card. This looked to be the match for first place as Ben was also 2-0 to start the tournament. I knew Ben would use Black Widow global against me, and his first turn purchase of Confront the Mighty meant Surtur was going to be hurt this match. I decided to go the Wonder Woman then Dreadnaught route, however Every time Wonder Woman rolled, she came up on her 2 fielding cost side. She was Knocked out with Confront the Mighty, and of course rerolled on the heavy side… I was unable to really get any flow going this game, and Ben was rolling almost everything due to Mimic. (I don’t think I had any bolts to even take out Mimic either..) Ben took this match quite easily when Batman came out to pump all the sidekicks. Kim was running a very fast Team Up team using Ant-man and Yuan-ti to make them unlockable. Her team has a weakness in Static Field, but I did not have that, so I knew that match would be a race to lethal. This would be my final match of the night, and Kim was also on only one loss. This would be for second place and Black Widow Force attack also wasn’t going to help this game. I decided to run Dreadnaught Surtur and Sidekicks. I was able to get Dreadnaught Turn 1, and setup for Surtur purchase turn 3. Turn 5, I took 17 damage from the team up combo going off, and if it wasn’t for a sidekick I fielded I would have lost. 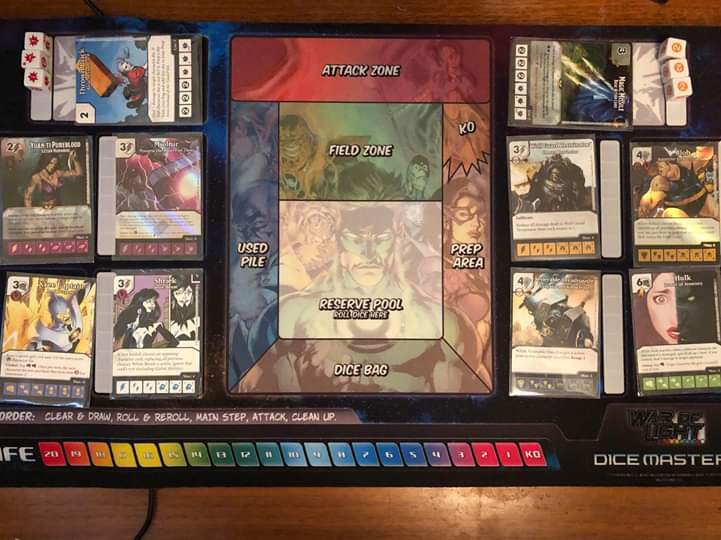 The following turn, Dreadnaught, 2 Black Widow’s and Surtur made the field and I was able to swing back for 25+ Damage. Very close match and if Black widow didn’t roll I would have been dead. Woohoo, My Easiest Match of the night. I got to enjoy the other matches and eat a sandwich. My style of play is quick games, combat damage and this team does just that. Matches are usually over before the 30 minute time limit. The event was fun, it was nice to play competitive meta teams, and was really good to see 5 different team builds. It was a very nice afternoon to play, and a huge shout out to Arge and all the One Big Weekend. We are hoping to hold similar events when the weather gets better up North, and attract players from Michigan, Ontario, and Quebec.